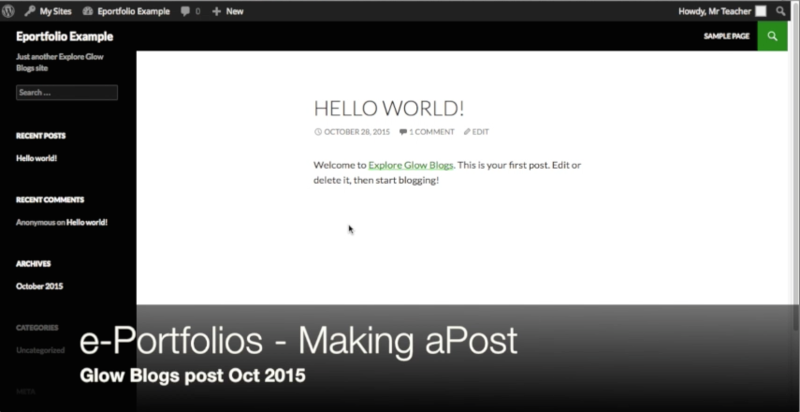 Profile Tags are added to e-Portfolio posts to help create the profile. You can only have one Profile Tags per post. To add a Profile Tags to a post: Create the post in the usual way, highlight the appropriate radio button , publish the post. You can edit the post and change or remove the Profile Tags at any time. As of October 2016 Profile tags appear on the bottom of each post and can be displayed in the tag widget. Profile Tag on post click to see full sized. 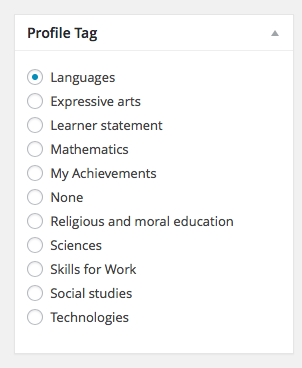 e-Portfolios come with a set of 24 pre-created profile tags, 11 of which are ‘enabled’ and can be used. Other tags can be created on a blog by blog basis. enabling and creation of tags is done on the dashboard; Choose Posts and then Profile Tags from the left hand bar.